Light bulbs talk to River Madden; God doesn't. When the homeless schizophrenic accidentally fractures a dimensional barrier and steals a gym bag containing a million dollars, everyone from the multiverse police to the local crime boss—and an eight-foot tall demon—is after him. Can he dodge them long enough to correct his mistakes and prevent the destruction of three separate dimensions? If he succeeds, will the light bulbs stop singing off-key? 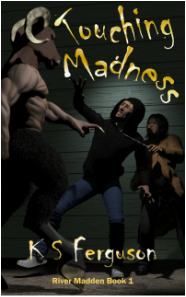 Touching Madness is available at Amazon, Smashwords, Kobo, Barnes & Noble, and iTunes. Touching Madness is the first novel in the River Madden series. River's story continues in Undercover Madness.